Thanks to both Renata Clark and Jiří Pátek for their assistance. 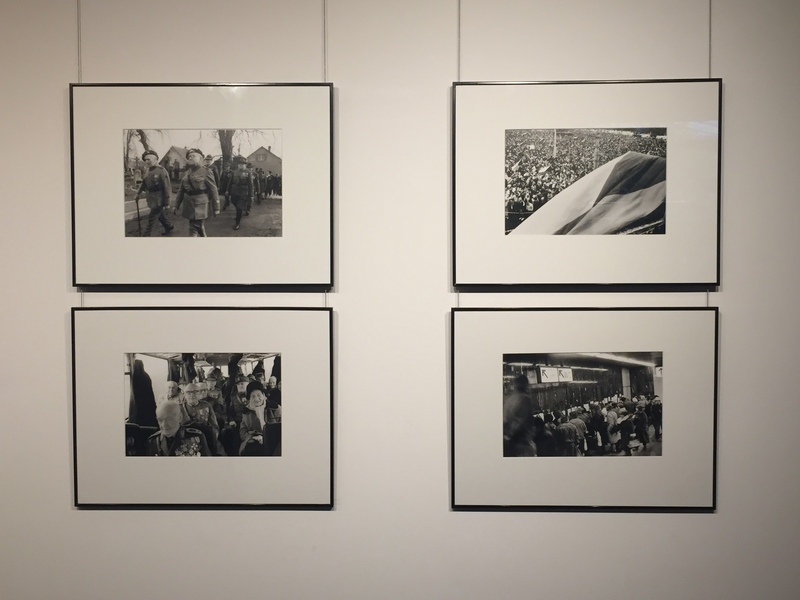 Hungary has a reputation for its high-calibre photography, with a historic cache of celebrated photographers that includes Robert Capa, André Kertész and László Moholy-Nagy, to name only a few. I’m therefore not surprised to see the passion and breadth of Budapest Photo Festival’s 2018 programme, which is packed with contemporary Hungarian photography alongside a wide range of work from international artists, such as Paulo Nozolino, Alain Laboile and David Pujadó. Taking place from February 28th until April 20th, it encompasses an impressive thirty-eight exhibitions whose creative and thematic depth touch on desire, identity, urban decay, space, temporality and family. The greatest anticipation however is reserved for Sandro Miller’s Malkovich Malkovich Malkovich: Homage to Photographic Masters, arriving in Budapest as part of a world-tour that has encompassed Australia, China, the US and Europe. Sandro’s inclusion in the festival, along with guest attendees like art-house filmmaker Béla Tarr, adds a touch of prestige to an already exciting roster of events. With only a limited time in Hungary’s capital, I head straight to the Malkovich show at the Műcsarnok Kunsthalle. The importance of this artistic collaboration is shown in the way images from the exhibition permeate the city’s social space: the BPF logo adorning bus stops alongside twin John Malkovichs, and, as I make my way down Andrássy út, he watches over me in the guise of a made-up Meryl Streep. 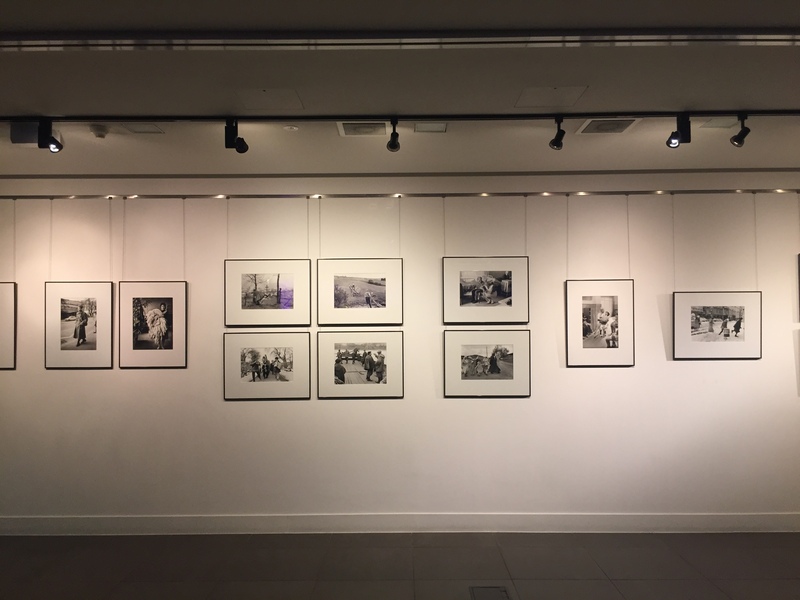 Malkovich Malkovich Malkovich: Homage to Photographic Masters is a visually impressive show, tangibly evinced by the recreation of so many iconic images in one space. A collection of technically-precise facsimiles rather than perfect imitations, these are faithful recreations resulting from the detailed research of a pool of talented artists. What might otherwise be a disparate agglomeration is unified by the show’s shared protagonist: John Malkovich, weaving himself like a mischievous time-traveller into one-hundred-and-thirty years of visual history. Malkovich achieves various levels of self-effacement here. He makes an incredibly convincing Andy Warhol, Albert Einstein and Igor Stravinsky for example. He is also believably transformed into a young boy through costume, facial expression and a clever rendering of perspective, in Diane Arbus’s Child with a Toy Hand Grenade in Central Park, N.Y.C. Understandably he is less successful at embodying the physicality of famous blonde-bombshell Marilyn Monroe or African-American Muhammad Ali, though he still manages to emote something of their persona in these shots. His features wax and wane from photo-to-photo in a postmodern game of “peek-a-boo” – sometimes genuinely merging with and sometimes visible within the image. Sandro has sincerely stated there is no intention of poking fun in his works, only of “an honest attempt to make these things as perfect as possible”. However, there is an inescapable amusement to be had in seeing the well-known actor perform the “roles” of a variety of well-known personages. Malkovich channels something of the naughty schoolboy in his appropriation of these often revered cultural icons, while the show’s modus operandi sometimes undermines the authority of the original image, and intentionally or not, draws attention to its constructed nature. Perhaps this is why the Herb Ritts re-creation of Jack-Nicholson’s Joker is to my mind one of the more perfect pieces: not only a visually arresting replica, but lacking the occasional disparity between the original’s content and its appropriation, with both Nicholson’s 1988 shots and Malkovich’s chameleonic work with Sandro channelling the same sense of performativity and irreverence. A by-product of the project’s play with image is how it flattens the contextual depth of the more social realist works; unmooring them from their specific historical moment and neutralising their mobilising potency. This is particularly pronounced with the implicit indictment of racism in Gordon Park’s American Gothic, Washington, D.C, where “re-casting” with a white man has been acknowledged as contentious by Sandro, and arguably with Dorethea Lange’s image Migrant Mother. In foregrounding performance over politics, Malkovich Malkovich Malkovich sometimes unwittingly obscures lived socio-historic realities. However, acknowledging that this postmodern approach can be problematic doesn’t detract from Sandro’s honourable intention to pay homage to such a rich visual heritage. An entertaining blockbuster of a show, its visibility allows it to connect historic works with a new audience and to sustain the legacies of myriad influential artists. In the end, Malkovich Malkovich Malkovich is an imaginative, amusing, technically assured exhibition that, beneath the fun and games, also provides testament to the empathic ability of great actors and photographers, both able to elucidate a common humanity. Dotted across the sprawling, architecturally imposing city are a dozen other shows I’m keen to see; Objects of Desire, a group show by Hungarian photographers (3rd March – 6th April); a key, contemporary show Still Life at Kiscelli Museum (7th April – 24th June); Deim Balázs’s Space at B32 Trezor Galéria (8th – 30th March), and Invisible Cities, curated by Festival Director Szilvia Mucsy (3rd – 31st March). Given this is my first time in Budapest I can’t forfeit the opportunity to do some sight-seeing, but I am resolved to see at least one more exhibition. I decide on the enigmatic black and white works of Invisible Cities, located downtown at the festival’s epicentre. Before heading there I attempt some Hungarian while grabbing a face-full of delicious, chocolate-filled pastries, and coffee in hand wander through the drizzly streets. I get some amazing birds-eye views of the capital from atop St Stephen’s Basilica, all the tourist-baiting attractions laid out ahead of me – the Royal Palace, the Liberty Monument on Gellért Hill – and spy the Danube majestically winding through the city. I arrive soon after at Budapest Project Gallery. Invisible Cities, representing the tradition of contemporary Portuguese photography, centres on the work of Paulo Nozolino and José Manuel Rodrigues; their monochrome images striking against the plain white walls, encompassing both sombre symbolism and poetic beauty. It is a productive partnership, with the artists expressing similar concerns (man’s relationship with his environment) but utilising different moods to explore themes of change and transience. Paulo Nozolino’s imaging of urban existence draws you in with its minimalism; a grainy aesthetic of monochrome, high-contrast, A5-size shots. Obscuring specifics, people become featureless shadows. Buildings merge into darkness and skies glower forebodingly. There is an emphasis on the ebb and flow of life’s essential elements, with the introductory shot evoking the cosmic as lights curve around black space. Aesthetically a battle is being waged between light and dark. Bright lines rupture the image in Bruxelles (1981), while in another the lit windows of a looming high-rise puncture the gloom. Narbonne (1986) seemingly shows a father and son in silhouette, watching a plane from across the sky. The details are few but their assemblage is compelling – the distillation of a drama, the diminutively sized image evoking childhood nostalgia and a yearning for the past, even though the image carries the threat of war. Nozolino’s work also potently effuses alienation and decay, with human figures shown in isolation and often obscured against their landscapes, as indistinct as the crumbling buildings that linger in semi-darkness. Las Vegas (1978) subverts the city’s conventional depiction as one of flashing neon and high-stakes drama, showing it instead as a drab, post-apocalyptic wasteland whose lights are barely discernable on the horizon. Prefiguring today’s abundance of solipsistic devices, El Paso (1978) presents a deceptively simple image of a TV in a mostly featureless room. The image on the screen however shows a man behind bars, echoing the sparse room and dark window in which the picture was taken. Nozolino, commenting on our modern obsession with technology in 2015, noted how “many people are lost in their gadgets, success and money, but they are distractions in regard to what really matters… We are only passing through, we should never forget that.” Not only do his words further highlight society’s increasing atomisation, but he elucidates the importance of recognising our ephemeral existence. José Manuel Rodrigues’s photography addresses similar motifs but presents a more positive interpretation of change, lacking the pessimistic taint of Nozolino’s work. His use of expressive symbolism posits a continuity between humans and their environment, as we see in various images of women reclining in or near water. The subjects’ heads peek out from the corner of the photo, juxtaposed against large bodies of water in a sort of physical and mental merging. Not only does this suggest the elemental in us, a symbiotic connection between internal and external worlds, but it proposes a more reciprocal and less anthropocentric relationship with our environment. Decay and transience are also depicted, but sidestep any sense of fatality. The monochrome images, bright and crisp, show these processes as integral to life, expressing an almost anthropological understanding of them. One untitled work conveys a kind of symmetry by mirroring a gridded window on the right, its inverse image on the left showing the shadow of the photographer taking the picture – evoking both creation and impermanence. This sense of ‘yin and yang’ harmony is depicted throughout Rodrigues’s photography, expressing the interdependence of light and dark, life and death. On the second floor of the gallery is a selection of his larger, landscape-focused works. Swampy rock pools and bodies of water – the only colour images of the show – suggest an almost timeless, primordial quality. One photo in particular can be interpreted as a hierarchy of creation: the bottom stratum of the frame formless shadow, the next mineral matter, then rising up into a man-made conical form. Quietly enigmatic, these images focus on the general and elemental in a bid to elucidate the nature of being, existence, and our part in an interconnected universe. 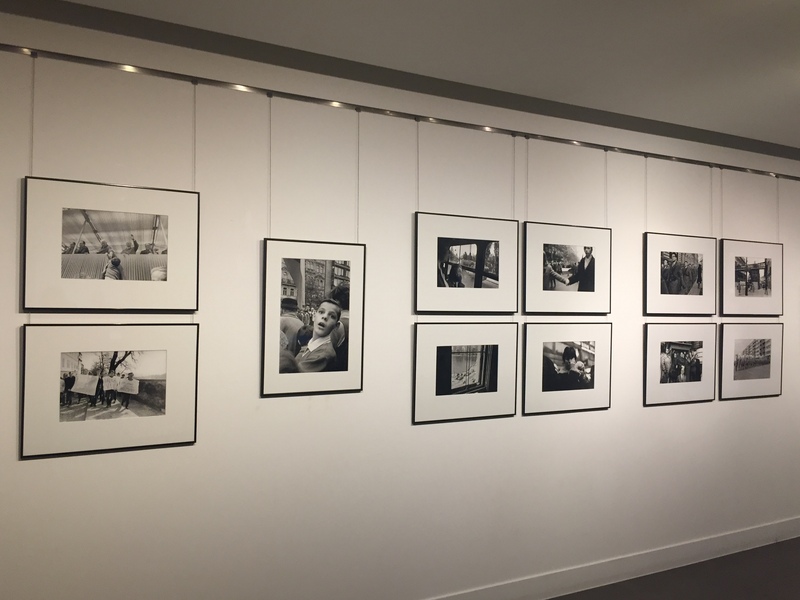 Before departing for the airport and leaving this fascinating, multi-faceted city behind, I have a brief moment to visit the opening of David Pujadó’s Biedma – Poems: from ink to light at the Instituto Cervantes de Budapest (showing until May 16th). His works are quiet, contemplative expressions of the poems of Jaime Gil de Biedma, with Pujadó’s minimalist aesthetic the result of him wanting to “say many things in very few words”. It is an affecting union of words and images. But unfortunately I soon have to say “viszontlátásra” to Budapest, to its delicious food and thriving photographic scene, leaving BPF 2018 to its on-going successes, at least for another year. Daniel studied Humanities and Media at Birkbeck University, with an emphasis on visual culture and spectatorship, and is currently completing his MA in Contemporary Literature and Culture. A keen writer from an early age, he currently produces articles for London Photography Diary, Photomonitor, and a number of other online publications, as well as maintaining a blog of personal creative work entitled The End of Fiction; a mixture of poetry, prose and film. Musing on the theme of gender performance, the exhibiting artists have sought to undress, metaphorically and literally, the subjects of their lens. Each seeks to extricate them from the paraphernalia of prescriptive gender identities; to open up a space for individual self-expression and to elucidate the performative nature of masculinity and femininity. As Judith Butler has famously stated, “to say gender is performative is to say that nobody really is a gender from the start.” Butler’s words illustrate modernity’s ongoing project of unravelling “essentialised” sexual stereotypes and gender norms, emphasising their socio-cultural perpetuation rather than any basis in biology. 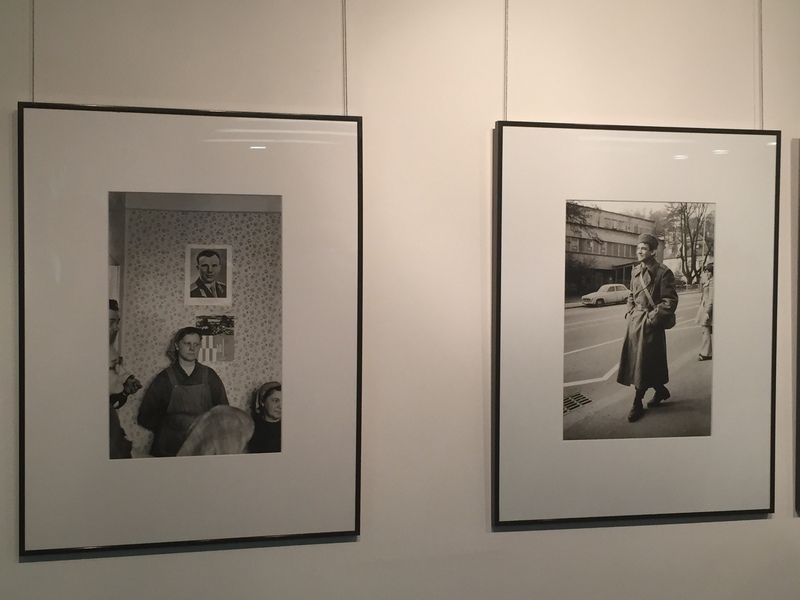 The exhibition displays a range of varied but complementary perspectives on gender. Andrew J Burford’s approach diverges from conventional presentations of the non-binary ‘other’ by photographing his subject in banal, domestic environments, whilst simultaneously challenging masculine and feminine categories through ironic juxtaposition. Lucy Le Brocq’s black and white shots of drag king Calvin Decline, similarly illustrating gender as performative, also suggest the discovery of a more ‘authentic’ self through gender play and an identity outside the confines of a male/female polarity. Finally, Jess Goodridge’s assemblage of experimental shots and portraiture explore the slippage between biology and culture, highlighting genders’ socially constructed basis; showing how the symbolism of femininity and by extension masculinity are arbitrarily projected onto the blank canvases of human bodies. I am She: I am He is London Photography Diary’s 6th and final show, curated by Brigid Cara Reid and Ellie Hemsley. In concluding the year-long programme, we would like to thank our exhibition partner Carmel by the Green for their encouragement and collaboration throughout this exciting undertaking. Also invaluable to its success has been Exhibition Manager Ivanna D’Accio’s unwavering curatorial support and enthusiasm. Finally, a thank you to The Photography Diaries’ publisher, Ashley Lumb, without whose guidance and perseverance this programme of shows would not have been possible. Andrew J Burford (based in Australia) is a queer artist raised in South Africa. He completed his degree in Creative Advertising at the University of West London in 2008, before moving to Australia to develop his artistic career. Burford received the Kodak Professional Excellence in Photomedia Award in 2011, and was also recipient of the Josephine Ulrick and Win Schubert Photography Award the following year. Burford has spoken and exhibited work internationally; in the USA, Australia, Germany and the United Kingdom. He also has work held in private collections across Australia. Burford uses his practice to seek an understanding of the fractured situations and modes of being within culture relating to masculinity, investigating the gap between a conventional masculine male and ‘the other’ and the supporting traits associated with both. It is an exploration of these divergent masculinities, through performance, installation, photography and video, which he pursues by examining socially supported stereotypes and expectations. His series, Untitled (Taylor), is a photographic look into gender performance and a celebration of the banal. By steering away from the overly camp aesthetic usually employed to portray drag queens, he presents a world where the importance of gender becomes as stale as the tasks undertook by his subjects. Lucy Le Brocq (based in Brighton, UK) was born in 1986 and left university with an honours degree in Fine Art. Her work explores the complex interaction between the individual, gender and society, with her central photographic mode being documentary. She has been a photographer for over ten years, and uses the medium to explore the ambiguities of lived experience; interrogating where artifice ends and authenticity begins. Le Brocq’s intimate black and white photographs document her time spent with female drag performers, or ‘drag kings’, depicting their tentative transformations into their on-stage personas. The exhibited photos depict Ari Rice bringing her alter-ego Calvin Decline into being, a representation of toxic white masculinity. These photographs convey Le Brocq’s understanding of gender fluidity; as Ari becomes Calvin, ‘male’ and ‘female’ masks slip and are shown to co-exist. Her work asks the viewer to reconsider the polarised nature of gender; depicting the beauty in the non-binary, and providing us with a glimpse of the person behind the performance. Jess Goodridge (based in the UK) is a photographer whose work is fiction based and plays with the timeless and semiotic qualities of analogue photography. Through her quiet, melancholic images, her models retain, despite photography’s endlessly reproducible and polysemous nature, a sense of singularity. Goodridge graduates in July 2017 with a first class honours degree in Photography from Nottingham Trent University. Goodridge’s series of images combine the styles of experimental and portrait photography. Similar to the adjoining works in this exhibition, her images are self-reflexive. Photography, often seen as providing a true reflection of reality, is depicted as performance; staged and acted out by both the photographer and the subject, seen in the use of props as well as composition and lighting. Her images elicit a journey of self-discovery; a space where it is possible to discover one’s own unique identity in a world comprised of binaries. The visual language of these photos reference life and death, as well as stereotypical markers of femininity, such as fruit and flowers. In conflating the two, she draws parallels between the transitory nature of life with the similarly shifting paradigm of gender identity. Carmel by the Green is very excited to present Full Disclosure, the first ever presentation of work in the UK by Australian photographer Dr. Ray Cook. A deeply incisive, honest and idiosyncratic artist, the exhibition consists of a wide-range of his output from his ever-expanding oeuvre. Starting with some of his earliest photography from the late 1980s – the anarchic When my ship comes in, I’ll be waiting at the airport – it also includes his visual rumination on the aftermath of AIDS with “at first I was Afraid, I was Petrified” in 2002, as well as reflection on his changing relationship with the ‘gay-scene’ (and its appropriation by the mainstream) in Not with a bang but a whimper. As I took in the images throughout this year’s Sony World Photography Awards at Somerset House, I was struck by the variety of photographic lenses presented to the viewer. From Photographer of the Year: Frederik Buyckx, to images by youth and students. There was a particular focus on England’s, Martin Parr, known for his satirical and anthropological lens, who was awarded Outstanding Contribution to Photography this year. What struck me were the images by Parr, which are rarely showcased, and images by photographer Tasneen Alsultan of Saudi Arabia. Martin Parr has been recognised for his particular ability to capture ordinary, everyday life in Britain, and to satirise images of cultures, people and particularly the tourism industry. At the Sony World Photography Awards there was a special presentation of his work, including black and white photographs focused on abandoned Morris Minors set in the countryside along the West Coast of Ireland. Unlike his other work, these photographs display a gentle and ethereal world, with a keen eye for humour. Mist, awestruck hills, ducks, chickens stare fondly out of the front windows; there is clearly a serene effect these pictures emit —contrary to Parr’s usual work. Another photographer of interest was Tasneen Alsultan of Saudi Arabia. Her work: “Saudi Tales of Love” which won first place in the Contemporary Issues category, cracks open stereotypes in Saudi Arabia. In a country often deemed the international symbol of Islam, there exists a vast gap between the Qur’an and local traditions—which Alsultan eagerly revealed through her pictures. One can see this gap through her sensitivity to detail. Alsultan was born in the United States and educated in England before moving to Saudi Arabia. for her undergraduate studies and began to study ethnography of Saudi women abroad. She married at seventeen and lived as a single parent for six years of her ten-year marriage. was later looked down upon for her divorce. After her divorce, Alsultan realised there were many other Saudi women experiencing the same issues she was, and she became fascinated in uncovering these realities through the images. Alsultan followed widows and women happily married to women who were divorced; to weddings and intimate moments with strangers. Gathering these stories was about exploring the concept of love and utilising her lens to capture expectations of marriage, through ritual and marriage ceremonies. Both Parr and Alsultan’s work arrested me, and it is something special when a photographer can capture hidden stories of humanity from all corners of the world. Coleen is a Canadian writer and theatre director with a thirst to explore the world. She trained at École Internationale de Théâtre Jacques Lecoq in Paris, where she mentored with French playwright, Michel Azama. She has recently founded Open Heart Surgery Theatre: a group of international theatre-makers, creating work in London at Camden People’s Theatre, Mimetic Festival, Old Vic New Voices; in Paris at Plateau 31 and recently presented ‘This is Why We Live’ in Toronto at The Theatre Centre and First Draft at Falaki Theater in Cairo. She is constantly inspired by photography and the power of the image. As anyone who has lived in a metropolis can attest, the speed of daily life can be relentless. We are often swept along with the crowd, mediated blindly down streets, onto station platforms and underground, up escalators to our place of work and home again, with such breathless pace that we often become indifferent to our surroundings. Technology has further exacerbated the issue, offering up constant distraction and connectivity, but distancing us from our immediate environment and those physically closest to us. In his essay of 1903 entitled “The Metropolis and Mental Life”, German sociologist Georg Simmel theorised this ostensible aloofness as a mental coping mechanism against the overstimulation of city life (with its constant bustle, its crowds and rapid speed of change). He termed this the “blasé attitude”, the essence of which is “an indifference towards the distinctions between things.” Acting as a corrective to this perceived sensory ennui is Brandon Stanton’s infamous photo blog “Humans of New York”, a point of inspiration for this exhibition, which details with warmth the depth of lived experience of individuals, privileging the richness of such one-to-one encounters. His ongoing project helps to illustrate that, in our modern quest to be constantly arriving “somewhere”, we rarely find the sense of contentment and connection we strive for, and in our hurry miss the beauty and humanity all around us. “Belonging, Being, Becoming” brings together four artists each approaching this theme in varied ways, with conceptual, biographical and abstract interpretations. Ana Escobar looks to revalidate modernity’s denigrated concepts of irrationality and superstition and explores their uses as coping mechanisms for the insecurities of metropolitan living. Bohyeon Kim reflects on the evanescence of the emotions within the fast-paced milieu of urban life, using visual experiments to capture “abstraction of emotion” in city settings, while both Mamie Heldman and Yufan Lu highlight the fluid and transient nature of “belonging”. While Heldman reflects on the shifting importance away from familial bonds to that of a surrogate family of ones’ peers (especially for young adults’ self-conception), Lu portrays the fraught relationship of the Chinese student community in the UK to a sense of place; their status as temporary migrants tainting their sense of new beginnings and belonging with uncertainty from the start. Dark matter doesn’t bend to light is an on-going body of work. Through it, I challenge myself to explore photographically themes related to superstition, the unconscious, the supernatural. I strive to challenge the limitations of mental life brought upon by the conditions of contemporary life. I aim to create work that validates and re-enforces the value and needs of those very undermined concepts: the irrational, the unreason, the instinctual life. The piece develops from insecurities arisen from photography theory to the integration of that new knowledge, yielding a space where consciousness and intuition can cohabitate and flourish. The piece asks viewers to restore intuition as a valid tool to understand, critique and consume photography. Bio: Ana Escobar was born in Huelva, Spain in 1975. She has a background in fine art, having earned her bachelor’s and her MA in Photography at London College of Communication, University of the Arts, London in 2016. Escobar works predominantly with the medium of photography, including multi-media installations and live performance. Her main theme is the in-between space the artist inhabits, which is explored through the use of archetypes, alchemy, and mythologies in a psychoanalytical Jungian tradition. Inspired by my experiences as a painter and sculptor, my photographic practice embodies a preoccupation with how and where form is imbued with meaning. A site is the source of all the <abstraction of emotion> works and the place where creation and extinction of a city happen. I try to exchange with my subjects at each site through an artistic activity called an intervention. This records atmospheric emotion that was captured in the moment to moment of city life in order to interpret photography in diverse aspects, rather than limit it as a fact or historical reference. Bio: Bohyeon Kim currently lives and works in London. She is studying at University College London, MFA Fine Arts and studied oriental painting at Chung-Ang University in South Korea. Bohyeon’s photographs aspects which act as puristic elements of emotional backdrops to her pictorial world. Her resulting photographs creates visual works that blur the boundaries of photography and painting. Most people think of the word family in relation to blood; however, membership can be gained through shared experiences, momentary interconnectivity, history, and commonality. As young adults emerge into the world and move away from the various forms of community that have defined their sense of belonging, there is an intuitive search to form surrogate familial bonds that go beyond companionship, but lend directly to the integral pathway of self-identity. Bio: Mamie Heldman is a documentary photographer based in Brooklyn, New York. Born in Nashville, Tennessee, she graduated with a degree in Communications from the University of Tennessee, where she focused her research and writing on interpersonal relationships in connection with levels of self-disclosure. In 2014, she studied photography under Hally Pancer in Paris, France, where she explored ideas of self and observation. In 2016 she completed the one-year certificate program in Documentary Practice and Visual Journalism at the International Center of Photography. Her work includes themes of identity, intimacy, and sense of place. According to a report by Center for China & Globalization, there were nearly 92,900 Chinese students studying in the UK in 2015, making China the top non-EU sending country of overseas students. London, as the center of the UK’s higher education, remains its top attractiveness among Chinese who seek their further education here. However, in contrast to the huge number is the limited time most Chinese students are allowed to stay in the UK – around one year and a half before their Tier 4 visa expires. For them, the beginning of their life in the UK already has the end projected onto it. Doreen Massey talked about the unfair distribution of mobility in the age of globalization, which caused strata in people’s new “senses of places”. By asking my subjects to take me to their favorite places in London for a portrait, I intended to let them speak for themselves of their senses of London, and how they cope with their life as a temporary migrant. Bio: Yufan Lu is a photographer based in London and Beijing. Her work is mainly focused on urbanism, especially people’ identities and their connection with each other as well as the cities. She is also interested in black-and-white darkroom practices. She believes that the old-school yet romantic practice leads her closer to the essence of photography, as the word’s Greek origin discloses – “light drawing”. She is currently undertaking the master degree in Photography and Urban Cultures at Goldsmiths, University of London. Although the first known usage of Post-Truth dates back to 1992, the term’s popularity didn’t erupt until 2016; the result of a contentious electoral campaign in the United States, and the United Kingdom’s eventual cessation of membership from the EU. Oxford Dictionaries went on to crown it “Word of the Year”, defining the term as “relating to or denoting circumstances in which objective facts are less influential in shaping public opinion than appeals to emotion and personal belief.” In both cases, highly-charged rhetoric that pandered to existing prejudices filtered down from numerous TV personalities and media streams. Exacerbated by a relentless 24 hour news cycle and the virulent spread of untruths on social media, corrective statistics and factual rebuttals failed to cool the hotbeds of political discontent. Donald Trump’s election as 45th president of the United States proved the apotheosis of these divided times. In response to this on-going socio-political drama, The Art of Deception: Pictorial Acts of Post-Truth looks to explore, through the work of five international artists, how Post-Truth engenders a climate in which rhetorics of resentment –hate speech, misogyny, xenophobia –actively flourish. It investigates the power the media has, and visual media more generally, to (mis)represent reality; turning daily life into the power-hungry fever-dream of elites. Exhibiting a mix of documentary, digital and experimental work, the displayed photography walks the line between appearance and reality, language and image, fact and fiction, to analyse the divides and duplicities that this Post-Truth age creates. Paige Megan Hawley (based in London, UK) is a photographer specialising in the fine art industry. Her practice’s central focus is photography as it relates to issues around historic and contemporary feminism, using a range of photographic styles, from 35mm to digital and medium format. Hawley’s work has been exhibited at Truman’s Brewery, Four Corners Gallery, Chatham Gallery and the University of Greenwich. Michal Raz (based in London, UK) is an Israeli artist, whose works combine painting, screen printing, digital images and collage, and who through the exploration of these different media seeks to unify the conflicting polarities of modern life. She is currently completing her MFA at UCL Slade School of Fine Arts. Sebastian Wanke (based in Weimar, Germany) is a photographer and communication designer who holds a diploma in Visual Communication from Bauhaus-University. His works have been exhibited all over Germany (at Forum für Künste in Hannover and Kunsthaus Tacheles in Berlin, for example) as well as across Europe. They have also been featured in magazines such as Design Made and THINK TNK MAG. Wanke’s series of photographs from the computer game Battlefield, developed in collaboration with Christopher Falbe, illustrate how much war and violence have become distanced from our conception of daily life. Representations of war are increasingly technologically mediated, with computer games presenting more and more realistic, domesticated simulations of war: “The environment of the game Battlefield consists of always active maps – the virtual world thus acting independently of the presence of players in the game. Within these realistic environments, the player is offered various possibilities to actively engage in a fictitious combat or tactical manoeuvres.” Despite the realism of such games, the consequences of the player’s actions in it are of course highly abstracted; indicating our modern disconnect with the often very real and lived trauma of warfare. Lili Holzer-Glier (based in Brooklyn, New York) is a photographer whose work has appeared in The New Yorker, Vogue and The New York Times. Her first book, Rockabye, documents the Rockaways post–Hurricane Sandy, and was published in 2015 by Daylight Books. Michael Davies (based in London, UK) is an artist and filmmaker whose practice is based in and amongst the creative milieu of Tottenham Hale International Studios. His work is predominantly based on analogue photography, painting, video installation and narrative film. With his photography, he documents those occurrences he encounters in everyday life, and which are often far stranger than any he could conceive through staging or in isolation. A distillation of the nature of racial tension, which has seen a resurgence post-Brexit, Michael Davies presents a 35mm shot taken during the ‘Brixton Splash’ street festival in 2015. Here is “a lomo moment capturing the complicated relationship between the largely black community, centering around the ‘Barrier Block’ flats, and the local police.” The skillful composition of elements in the shot suggests an uneven power-play at work, and is indicative of the divisive effect xenophobic rhetoric helps engender. You could be forgiven for thinking that the images on display in Renata Buziak’s exhibition Medicinal Plant Cycles, an exploration of decay and regeneration, were actually facsimiles of paintings. One of the most striking things about them is their vivid colours, iridescent blues and purples vying with incandescent shades of orange. Their incredible amorphousness makes them appear fairly abstract, but, with nature and natural processes as their subject matter they are simultaneously pictorial, especially where traces of decayed plant matter are evident to ground the work. They could be the output of an earthy Jackson Pollock. Although, with their sublime level of detail, their textural range and freedom of form, one can’t imagine their conception by any human hand. As it is, in these works nature is the one holding the paintbrush…albeit with a little direction. Buziak has been creating what she terms “biochromes” for over a decade now, in an exploration of the overlap between art and science. The production of these images involve the placing of organic material on photographic emulsions which, when exposed to the elements and left over a length of time (about five to eight weeks), create a dazzling landscape of shapes and colours, a result of the reaction between the photographic chemicals and the process of decomposition (the bacterial micro-organic activity) in the plant matter. Exploring the outcomes of this rather unpredictable process, Buziak experiments with some of the conditions under which they’re produced, altering plant type, temperature, level of humidity and light, to achieve different results in her work. The spirit of nature is omnipresent as you enter the first room of works in Gallery 4. The caws and various calls of birds, the hush of the sea; all the sounds of Minjerribah/North Stradbroke Island on which Buziak carried out her research undulate throughout the space, helping to contextualise her images in their abstracted visual state. Starting with only a blank photographic backdrop and a sample of the island’s plant material, these biochromes have gone on to produce intricate and complex visions, beguiling to the eye and imagination. The first work (of Carpobrotus glaucescens, a plant with antiseptic properties) displays thick sandstone ridges, traces of the decaying plant, while surrounding this fossil-like outline, seas of cobalt blue swirl around orange abysses that encircle starry black islands. Other works similarly present a conflagration of colour. The leaves and stems of Abrus Precatorius are flanked with fiery gradients of red and orange, giving the impression of the expiring plant ablaze. There is something cosmic in the burgeoning of multi-faceted life across the dark photographic paper; the works suggestive microcosms of creation. Gallery 3 presents a curtained off area containing Buziak’s forays into time-lapse photography, along with a greater selection of her biochrome work. Among a selection of six singular pieces, a large moody panorama arrests the attention, showing the decomposing matter of Malaleuca quinquenervia and Corymbia intermidia swept up in a black and white storm of transformation, while to its right are a trio of smaller, iridescent and microscopically detailed images that invite you to look closer. While these biochromes are only suggestive of transformation – freezing on a fixed moment – her time-lapse work documents the process of decay usually unperceived by the human eye. Further blurring the artistic and the scientific, they illustrate just how intertwined organic degeneration and creation are; not antithetical at all but co-dependent processes. As the artist states, “we are part of the cycle of life. Through this decay, the regeneration at the same time of microbes, of different life, is visible.” It is a magnificent metamorphosis to behold. One of several videos shows the slow inferno of Centella Asiatica as shadow spreads through its leaves, gradually losing their solidity; the growing flicker of orange in outline around the plant as it turns charcoal black, the frame, however, still full of activity. The images glow hot and cold as energies transfer and states continually change; the aurora of colour evidence to us that, through dissolution, micro-organic life flourishes, eventually creating its own self-sustaining eco-system. As we watch these displays play out in front of our eyes, snippets of conversation between Buziak and members of the Quandamooka community break through from the overhead audio, describing the healing properties of the titular medicinal plants native to North Stradbroke Island. These dialogues underline the anthropological as well as the aesthetic nature of Buziak’s project. Her own upbringing in Janów Lubelski, Poland, inspired her interest in the medicinal properties of native flora, and led her to investigate the plant life of the aforementioned island. It is the inhabitants we hear detailing the varied uses of local plant life. Most memorable are the practice of mixing herbs with boiled “flying foxes” (bats) to ease asthma, and the addition of crystallised sap from the blood wood tree in tea to purify one’s blood. The importance of passing on this ancient knowledge to new generations, of keeping the culture alive, is clearly and earnestly stated. Cycles are obviously central to Buziak’s work, and her fascinating biochrome and time lapse experiments exemplify this through their depiction of nature’s recycling of organic matter. There is a slight disconnect in Buziak’s joint aim to “promote the recognition, appreciation, and value of local medicinal plants in the context of Aboriginal knowledge” at the same time as revealing “a beauty in decomposition, and rais[ing] notions of transformative cycles”. Though not incompatible, the two facets don’t quite unite, and perhaps a sole focus on either aesthetic displays of decay, or a documentation of the island’s culture, would further enhance the exhibition’s impact. However, if this dual approach jars slightly, it is not an unproductive union. The specific use of medicinal plants from the island as subjects of decay and regrowth only further highlights the enterprising and regenerative powers of nature; something Buziak elucidates with great insight and profundity in her work. Daniel Pateman studied Humanities and Media at Birkbeck University, with an emphasis on visual culture and spectatorship. He has embarked now on the next step of his academic journey and is currently undertaking an MA in Contemporary Literature and Culture. A keen writer from an early age, he produces articles for the London Photography Diary and a number of other online publications. He also maintains a blog of personal creative work entitled The End of Fiction; a mixture of poetry, prose and film. The London Photography Diary is pleased to collaborate with guest curator Stereoscope magazine at the University of St Andrews for the exhibition No Strings Attached, at Carmel by the Green in East London. This exhibition follows The Physical Fabric of Cities—organized by London Photography Diary and Elsewhere is a Negative Mirror, curated by the New York Photography Diary—and is the third in a year-long program of shows being organized by The Photography Diaries. No Strings Attached is curated by Stereoscope magazine and the head curator for this exhibition is Ivana D’Accico. It is true that a casual, transient and less committed mindset pervades the nature of modern photography, and indeed the wider actions of the millennial generation. The phrase No Strings Attached has become a hallmark of this generation, and this exhibition explores how a flippant attitude within youth culture has translated into its relationship with the camera. In a world where the mechanisms to capture images are so readily available, photography has become dispensable. This theme discusses the notion of whether we are less inclined to enter into a serious relationship with the medium? Entering its sixth year as a publication, STEREOSCOPE was founded as a means to celebrate the history of photography in St. Andrews by aligning the famous Special Collections of Photography and current St. Andrews photographer’s work. Under the theme No Strings Attached the magazine has provided a platform for students in St. Andrews to showcase their work and discuss the current nature of photography. STEREOSCOPE photographers Kate Engleman, Lallie Doyle, Lauren Santucci, Meleah Moore and Sophie Levine present five idiosyncratic approaches to the physical process surrounding contemporary photography. With settings ranging from rural Kolkata to Los Angeles, this collection of photographs demonstrates the modern romance between today’s youth and the camera. I have always been technologically inept. This may be because I just don’t understand the technological equipment, or because I choose to not learn how to use the new mediums. I have always valued film photography, shooting on my grandfather’s tempestuous Canon AE-1. As someone who loves constant stimulation, it forces me slow down. With the incredibly clear images phones can now produce, and the endless forums that allow people to share those images instantly, the committed relationship between man and camera has become a thing of the past. My images were taken in Los Angeles, my home city, a place I have always felt very detached from. I have started to shoot more around LA, reconnecting with my city through exploring with my camera. Having recently begun to travel alone, I have found great solace in shooting film. My camera has become my favourite travel companion as it enables me way to connect with the places in a way I wouldn’t otherwise be able to. Photography right now is flexible—we have the luxury to experiment and be relaxed about the medium. I photograph the minor movements and brief moments that illustrate a comparable and relatable human experience. In chaining these instances together, we can remember and celebrate our humility despite the conflicts and structures that estrange and divide us. It would be difficult to distinguish the refugee from the privileged and the free in these photographs. Whichever camera I use, whether it is a clunky DLSR or a £5 disposable camera, I am shy about taking photographs of people. I take photos of the lovers or friends I feel intimate with—but I do not want them to know I am taking their photo. These photographs were taken both in my home town of Detroit and in a refugee camp in Athens where I have worked for the last year. They are casual and unplanned due to my efforts to remain unnoticed and to my treatment of photography as unforced and informal. I was trying to add up the visual sources I have encountered today and got frustrated by the superfluity; hitting and quitting photos on my newsfeed without a second thought. The inquiry as a photographer has become how to make an image more indispensable, to warrant more than a glance. Though this idea has some irony; I photograph glances, quick encounters, short-lived beauty. I like pausing movement because something draws me in, feeding on the energy of observation. It’s the subtleties that are alluring, catching people in their element without changing it. This became my approach to my photographs taken during a period working with a sustainable energy company in Kolkata, India. I photographed moments which were brief and unaffected, but stay for a minute and they might reveal more. This series holds its interest in the relationship between nature and the human touch, attempting to deconstruct the normalities of our everyday world. The images obscure, fragment, and isolate—allowing the viewer to assign their own narrative. I look to the medium of photography in a formal way, but am influenced by and seek to evoke a more playful sense of the bizarre. In using analogue photographic processes and originally printing these photographs myself, I was looking to explore a less dispensable and instantaneous side of the medium. The compositions were made from a bit of card and the help of a pair of scissors—no hidden strings or Photoshop. The idea of ‘No Strings Attached’ manifests in many different ways, but it is the intersection between analogue and the instantaneous that I am interested in exploring—the spontaneity of our generation applied to concentrated processes. I am in a deeply committed relationship with photography; a relationship that, like my other human relations has had peaks and troughs. Photography is used as a way to cement my stream of consciousness. My works, in general, are staged: they are not constructed in a callous and whimsical manner, but rather meticulously put together to recreate a pre-envisaged narrative. I photographed Brooklyn band The Britanys in Williamsburg this summer: I love to photograph musicians because I find music very visual. While music is meant for the ears, for me music is seen just as strongly through the eyes – it conjures up images of past memories, of colours, of the thrashing of limbs in a dark club to the creeping of light through the blinds in the morning. This series conveys the intersection between music and photography, because, in a post-depression era where the creative drive has become stunted by mounting student loans, it is important to unite the arts. These photographs represent my more old-fashioned relationship with the camera, one that is more carefully considered and planned, rather than the laissez-affair attitude that has come to define modern photography.